Why are shrimp America’s favorite seafood? Read on to learn about the possible health benefits—and see two fabulous recipes. It’s easy to locate the shrimp cocktail at a dinner party: just look for a crowd hovering over a platter. According to an article on Slate.com, shrimp are the most-consumed seafood in the United States. It has replaced tuna as the fish favorite in America. Shrimp are high in cholesterol, and there have been some questions about the veracity of the “wild caught” promises made on the package labeling. It is hard to prove the exact source and conditions of a package of shrimp. However, most health experts agree that as long as you are not eating large quantities of shrimp daily, the shrimp pros still outweigh the shrimp cons. We’ve reeled in two of our favorite shrimp-sational offerings below. This recipe from combines shrimp with zucchini “noodles,” and would make a satisfying lunch or light dinner. Cook garlic and onion in butter and lemon for 1 minute on medium high heat. Add bell peppers and shrimp and cook for another 6–7 minutes. Make zucchini into “noodles” with spiralizer. In another saucepan, cook zucchini in a small amount of water on medium heat for 4–5 minutes. Drain noodles and serve on plate topped with shrimp. Even if you’re making them indoors, these grilled shrimp are a taste of summer. If using bamboo skewers, soak them in water while preparing your ingredients. Place lime, garlic, paprika, black pepper, and salt (if using) in a small bowl and whisk together. Place the marinade in a sealable plastic bag large enough to contain the shrimp. After placing the shrimp in the bag, seal the bag, removing the air, so the shrimp is well covered by the marinade. Next, thread the shrimp on the skewers (approximately 5 per skewer). Lightly coat each prepared skewer with oil prior to grilling. If preferred, use an oil sprayer. Grill until fully cooked. Place on a platter and sprinkle with fresh cilantro. You can serve with a rice and vegetable dish or with vegetable skewers and a small baked potato. * To further reduce sodium, omit the salt. Whether you’re cooking just for family or for special guests, these two healthy and tasty dishes will thrill everyone at your table. 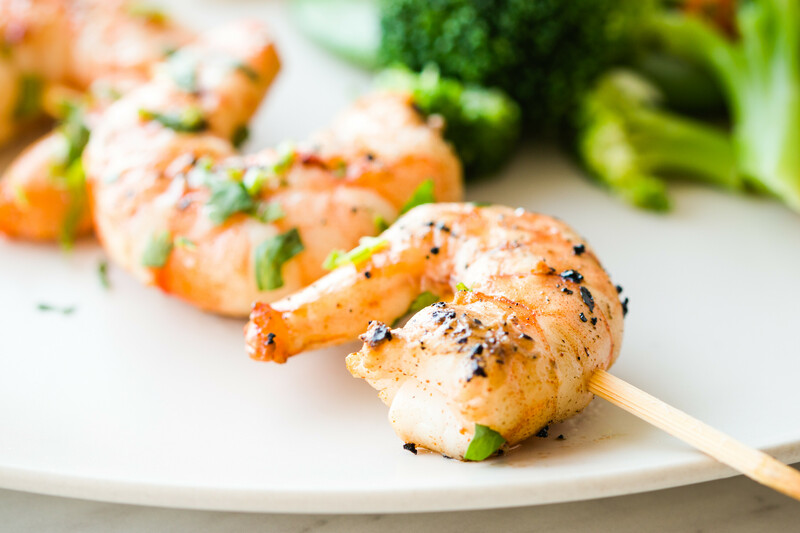 Adding shrimp to any entree just makes it seem more fancy and fun, but it’s also a great way to consume protein without the fat.